Boosting the speed of Mission Control animations can make Mac OS X feel a bit faster when switching between windows, spaces, and apps within the feature. It’s easy to do and reversible if you decide you don’t like it, launch the Terminal to get started. 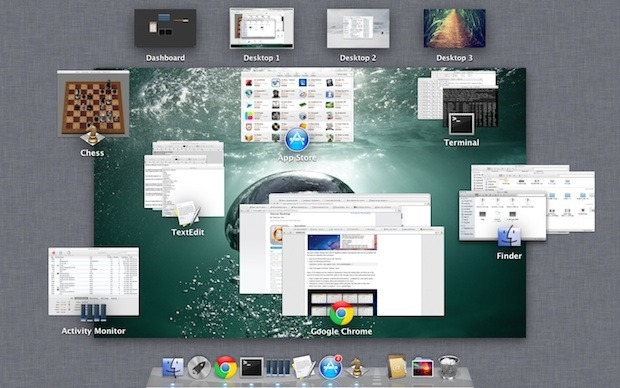 These defaults commands work in Lion, Mountain Lion, and beyond. Do a three-fingered swipe up or down to see the difference in speed. As you may have guessed, you can adjust the animation speeds by changing the number after the -float flag, the larger the number the slower the animation, and the lower the number the faster the animation. The default setting is probably about 0.2 or 0.25, meaning anything larger than that starts to be slower than default. Whole numbers become increasingly slow, similar to holding down the shift key. The effect of disabling the animation is quite jarring and unless you’re trying to preserve frame rate for some reason it’s not very pleasant. Check out more of our Misson Control tips. this is a great tip, thank you. I only wish there would be something like this for fullscreen, and workspace switching. Wozers, this is MUCH quicker. THanks! Could yuo write a command line witch will make faster swipe between desktops, or makes faster enter in to full screen mode? Nice tip, thanks. Is there a comparable command for minimizing items to the Dock? I don’t mind the instantaneous look; I prefer speed. Mission Control was one of the features I most looked forward to in Lion; but to my knowledge, you can’t get minimized items to show up in it. Yes, I know it’s possible to set Expose for this kind of thing, but I’d like them in Mission Control itself. I wrote to Apple but probably will never hear back. If anyone knows a way to get minimized to appear in Mission Control, please share it. Does anyone know if there’s a way to disable the full screen animations and the screen switching animations? Thank you. This needs to be an option in System Preferences. The default setting is just too slow. Amazing tip ! Love it! Love oSXDaily! Great tip! Like a previous poster said, a command to speed up swiping to another desktop would be great. Thank you. I would also like a command to speed up full-screen animations. This isn’t making any observable difference for me either in 10.7.3. This is actually creating a weird bug. Now when I switch desktops, there’s a quick flicker showing the windows beneath the window I’m switching to. This is WORSE than the slow animation! So I tried quitting the Finder. No go either. Unfortunately quitting either Dock or the Finder left me without the ability to alt-tab (lol). Fortunately I still had a terminal window open so after moving all my windows old school style I found an open terminal window. Finder opens CoreServices folder where I tried opening the Dock there directly. Hmmmm. Invalid connection to do with initializing full screen ? Maybe if I got System Preferences open and switched the monitor resolution it fixes it ? Which is what I did. I went into Applications then opened System Preferences. Opened Display then switched it from “Best for built in display” to a random resolution in the Scaled list then back to “Best for built in display” . Alt – tab is going again. :| Oh Mountain Lion u so silly. You sir saved me from a logout/login. Thanks! I can confirm, this works in Mac OS 10.10 beta. Whenever I restart my Mac, the animation speed is zero. Means there is no animation, like on/off. Do you know why that happens and how I can “save” the animation? Thx. How can this be accomplished on macOS Sierra! ?